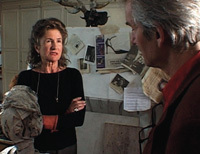 “(Ludin’s) film courageously probes the effect of this legacy, and the revelations are shocking…[he] doesn’t shrink from debating heatedly with his sisters onscreen or exposing them to their children as liars." Family drama and historical truth collide in this film about the painful legacy cast by Hanns Ludin, a prominent Nazi executed for war crimes in 1947. 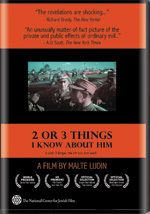 In this astonishing documentary, Hanns Ludin’s son, filmmaker Malte Ludin, breaks 60 years of silence and repression, investigating his father’s dark deeds and interviewing his still-denying sisters. The film is an intimate look at the descendants of a Nazi perpetrator, most of whom refuse to accept the history of their family and of Nazi Germany more generally. 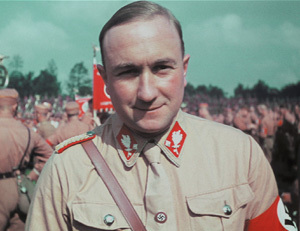 “A tattered family album of a documentary…2 or 3 Things I Know About Him can't reconcile Daddy's kind moon face with the Nazi regalia on his collar: His large hands, remembered so fondly by one daughter, signed deportment papers that dispatched other children's daddies to their deaths…gripping and confrontational viewing. “(4 Stars Editors' Pick): A bold struggle with the past and the silent present….In an era of shifting history and all-too-easily deniable facts, it's incumbent upon great films like Ludin's to share that viewpoint.